« Woodstock event remembers Holocaust. BOSTON (AP) — Matthew Nash’s grandfather only mentioned the photographs to him once. Twenty-five-years later, they are the subject of a new documentary on the Holocaust that Nash spent three years making after finding the pictures his grandfather took while serving as an Army medic in World War II. Kept hidden from Nash and others in the family, the photos were not something Nash’s grandfather seemed to want to talk about with relatives. But they were something he could never forget. Nash’s film — “16 Photographs at Ohrdruf” — tells of the first concentration camp that U.S. soldiers liberated in 1945. The 72-minute film will have its first public screening Thursday evening at Lesley University in Cambridge, Mass., and also will be shown as part of the Boston International Film Festival on April 16 and the G.I. Film Festival in Washington in May. The summer he was 12, Nash asked about his grandfather’s World War II service as the two were stacking wood in his grandparents’ barn in East Dorset, Vt. But Donald Grant Johnson, a former Army lieutenant, died in 1991 without sharing the photos with his grandson. Family members only spoke of the pictures in whispers. When Nash’s grandmother threatened to destroy them when the subject came up at Thanksgiving dinner in 1995, Nash and his sister felt compelled to secretly sift through their late grandfather’s belongings the following Christmas. That’s when they found an envelope marked “Holocaust” tucked away in a wooden trunk. Inside were a few letters and a series of snapshots of a war horror the 23-year-old Johnson encountered as a soldier in April 1945. Johnson took most of the photos at Ohrdruf in Germany. Nash believes his grandfather may have treated survivors of the camp, which the Germans had formed as a sub-camp of Buchenwald. On a personalized sheet of notepaper with “Don Johnson” printed at the top, the 65th Infantry Division Army veteran cataloged the photo collection as best he could. “Lime Pit — effort to destroy bodies,” reads one handwritten caption. “Griddle used in (vain) attempt to incinerate bodies — note skull bottom center,” reads another. “Small stack of bodies,” says yet another. Soldiers are on the outskirts of some of Johnson’s shots, standing together to view piles of emaciated and burned corpses. 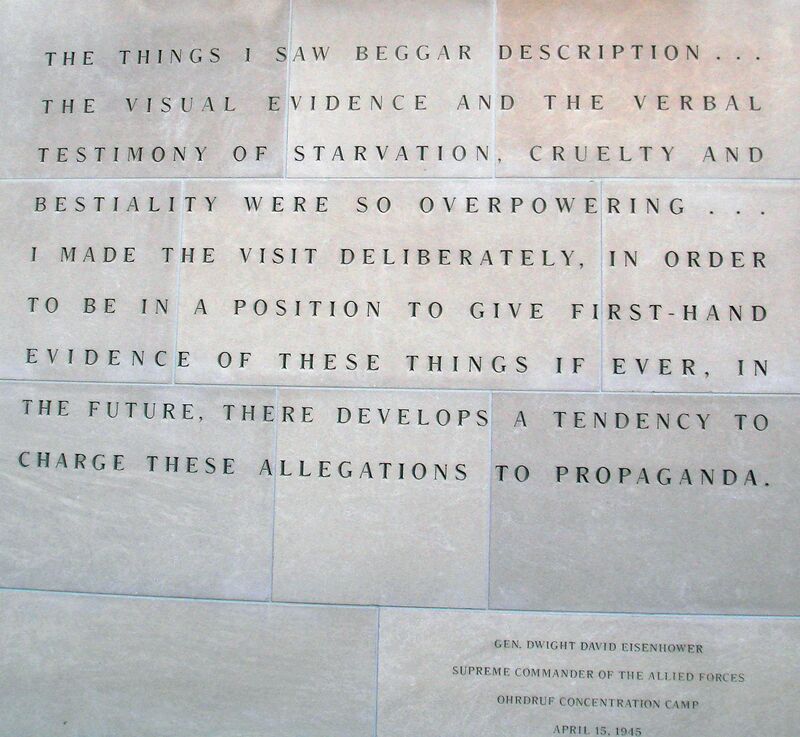 Gen. Dwight D. Eisenhower wanted many witnesses to the Nazi atrocity so that reports of it couldn’t be dismissed as propaganda. “He had as many units as possible come and see the camp,” said Geoffrey Megargee, a scholar from the U.S. Holocaust Memorial Museum who appears in Nash’s film. Johnson likely came to Ohrdruf within a few days of its liberation. He later returned home to become a banker, National Guard soldier, and a volunteer emergency-medical technician. Some of Johnson’s photos show survivors, including what he described as a survivor being treated by two camp doctors. The skeletal-looking man is lying on a cot, with what appears to be an open wound on his hip, as the men stand beside him. In another, a bare-chested boy of about 14 looks toward the camera, with what appears to be prisoner barracks in the background. Nash found 19 photos in all and used 16 in his film. His research showed his grandfather may have shot a few of the photos at Mauthausen concentration camp in Austria. The professor also discovered from letters his grandfather packed away with the pictures that he had wanted his photographs to become part of the U.S. Holocaust Memorial Museum. He said in one letter that he had visited more than one concentration camp, but Ohrdruf was engraved in his memory. Johnson died two years before the museum opened, and before he sent the pictures. Nash has since given the photos to the museum for its archives, and said he’s proud to have done that for his grandfather. Nash made the documentary with about $5,000 and the help of friends in the film business. Among film interviewees, Nash talked to veterans who served in the same infantry division as his grandfather, including Boston resident Edwin “Bud” Waite. The 87-year-old was an infantry soldier who wasn’t part of liberating concentration camps, but visited Dachau later. He said he sees value in Nash’s film effort. “I think it’s very important because the younger people nowadays, they don’t really understand concentration camps back in World War II,” Waite said. Megargee, who will give a lecture before Thursday’s screening, said Nash’s film opens up a personal window into what the Allies were fighting against in World War II. “When you can personalize the history, especially for younger kids, it helps to get them interested. It’s one thing to talk about tens of thousands of camps. It’s another thing to bring it down to the level of one American soldier,” he said.